Stimulant sensitization is defined as an enhancement of the behavioral response to drug after repeated drug exposure. We have examined the relation between the expression of behavioral sensitization and the release of the striatal neurotransmitters acetylcholine (ACh) and dopamine (DA). Rats were treated with amphetamine (4 mg/kg i.p., b.i.d.) for 12 days. The behavioral response to amphetamine challenge was assessed during the chronic treatment, at short withdrawal (2 days) and at long withdrawal (2–3 wk) from the drug. Neurochemical responses to amphetamine challenge were assessed in separate groups of rats at the two withdrawal timepoints using in vivo microdialysis. The expression of behavioral sensitization in response to a low challenge dose of amphetamine (0.5 mg/kg) was only observed after long withdrawal; indeed, tolerance was observed at the short withdrawal timepoint. In contrast, sensitization of the behavioral response to challenge with 4 mg/kg amphetamine developed progressively over the course of drug treatment and continued to increase throughout withdrawal. Striatal ACh release was enhanced by amphetamine challenge (4 mg/kg) in the chronically treated animals and this response also was greater at long withdrawal vs. short withdrawal. However, amphetamine administration had no net effect on striatal ACh release in animals previously given chronic saline injections. Amphetamine challenge increased striatal DA release but this response did not differ between drug- or saline-treated animals at either withdrawal timepoint. Thus, an enhancement of the drug-induced stimulation of striatal ACh release correlates with the temporal profile of the expression of behavioral sensitization to amphetamine. In contrast, amphetamine-induced DA release does not appear to correlate with the expression of behavioral sensitization in the same manner. Repeated intermittent administration of psychostimulant drugs such as cocaine or AMPH to rats can induce behavioral sensitization, defined as an enhanced behavioral response to a subsequent drug challenge (Downs and Eddy, 1932; Segal and Mandell, 1974; Post and Rose, 1976). Parallels observed between behavioral sensitization in rats and the clinically recognized phenomenon of behavioral sensitization in psychostimulant drug abusers (Ellinwood et al., 1973; Sato et al., 1992) have led both to an incentive-sensitization hypothesis of drug addiction (Robinson and Berridge, 1993) and to an intense interest in the neural substrates responsible for generating and maintaining behavioral sensitization. The primary pharmacological effect of psychostimulants, believed to mediate the behavioral activation produced by these agents, is an enhancement of DA function in striatum and nucleus accumbens (Creese and Iversen, 1975; DiChiara and Imperato, 1988). As a consequence, studies on the neural basis of behavioral sensitization have sought to determine the ability of chronic psychostimulants to potentiate DA release in these brain regions in response to subsequent drug challenge (for reviews see Kalivas and Stewart, 1991; Kalivas et al., 1993). This predicted effect has been demonstrated in numerous in vitro tissue slice and synaptosome studies (Robinson and Becker, 1982; Kolta et al., 1985; Casteneda et al., 1988;Kalivas and Duffy, 1988; for review, see Robinson and Becker, 1986). Since the development of microdialysis, these in vitroresults have been corroborated in vivo with the observation of potentiated stimulant-induced DA release after chronic administration of AMPH (Robinson et al., 1988; Patricket al., 1991), methamphetamine (Kazahaya et al., 1989; Hamamura et al., 1991) or cocaine (Kalivas and Duffy, 1993; Heidbreder et al., 1996). However, withdrawal from chronic psychostimulants initially may produce a state of tolerance with respect to terminal DA function indicating that the development of potentiated DA release after withdrawal from the stimulant is time-dependent. In vivo DA release is unchanged or attenuated in striatum and nucleus accumbens in response to an acute drug challenge given at short time intervals after cessation of chronic cocaine (Robertson et al., 1991; Segal and Kuczenski, 1992a;Heidbreder et al., 1996) or chronic AMPH (Segal and Kuczenski, 1992b; Wolf et al., 1993). Similarly, althoughKalivas and Duffy (1993) reported an increase in evoked DA efflux in nucleus accumbens 10 to 14 days after withdrawal from chronic cocaine, evoked DA release was attenuated after 24 hr withdrawal from the same chronic treatment regimen. Importantly, rats at these early timepoints of withdrawal nevertheless demonstrate behavioral sensitization to drug challenge (Segal and Kuczenski, 1992b; Kalivas and Duffy, 1993;Heidbreder et al., 1996). Thus, although enhanced terminal site DA release may be an important contributing factor in the expression of sensitization long-term, it does not appear to be an absolute requirement for the expression of behavioral sensitizationper se. In addition to the DA afferents, the giant aspiny cholinergic interneurons provide an important modulatory influence upon the activity of basal ganglia output neurons in striatum and nucleus accumbens (Kitai and Surmeier, 1993; Wang and McGinty, 1996). In striatum, the release of ACh in response to acute systemic administration of psychostimulants such as AMPH may be increased, decreased, or not significantly altered depending on the dose of drug administered and on the conditions of the experiment (for discussion see DeBoer and Abercrombie, 1996). This complexity of the cholinergic response to indirect DA agonists is due to the fact that at least two dopaminergic mechanisms can regulate striatal ACh release. D2 receptor activation inhibits ACh release both from striatal slices (Scatton, 1982; Baud et al., 1985; Forloni et al., 1987) and in vivo (Bertorelli and Consolo, 1990; Damsma et al., 1990a; DeBoer and Abercrombie, 1996). Conversely, D1 receptor activation has been shown to increase ACh efflux in vivo(Bertorelli and Consolo, 1990; Damsma et al., 1990b; DeBoer and Abercrombie, 1996). The effects of chronic psychostimulant administration on ACh neurochemistry have not thus far been studied. However, recent reports suggest an involvement of ACh in sensitization to stimulant drugs. Behavioral studies have demonstrated that systemic treatment of rats with the muscarinic receptor antagonist scopolamine can prevent the development of behavioral sensitization to methamphetamine (Ohmori et al., 1995a, b) and cocaine (Heidbreder and Shippenberg, 1996). In an in vitro study byTjon et al. (1995), it was demonstrated that electrically induced striatal ACh release is significantly greater after chronic intermittent morphine treatment, regardless of withdrawal duration from the opiate. As cross-sensitization can result between chronic treatment with morphine and AMPH (Vezina et al., 1989), this result may be predictive of the effect of chronic AMPH on striatal ACh effluxin vivo. Thus, an hypothesis for the neuronal substrates of behavioral sensitization to psychostimulant drugs could justifiably incorporate a role for ACh. Our experiments were therefore conducted to establish whether chronic AMPH administration affects striatal ACh efflux examined on subsequent AMPH challenge. Furthermore, these studies were designed to examine the relation between AMPH-induced behavioral change and striatal ACh neurochemistry as a function of the duration of withdrawal from chronic AMPH. It is hypothesized that a neural substrate for behavioral sensitization should be common to any period of withdrawal and therefore possess a strong temporal correlation with the expression of this phenomenon. Adult male Sprague Dawley rats (Zivic Miller Laboratories, Pittsburgh, PA), weighing 350–600 g at the time of surgery, were used throughout. Rats were housed singly in plastic shoebox cages under conditions of constant temperature (21°C) and humidity (40%) on a 12:12 h light:dark cycle (lights on 07:00), with food and water freely available. Behavioral testing of locomotion was conducted in shoebox cages which were transparent to allow for infra-red beam break detection of movement but were otherwise identical to the home cages. During the microdialysis experiments, animals were housed in cylindrical Plexiglass cages. Each rat was used in only one dialysis experiment and behavioral analysis was carried out in a separate group of animals in the event that the microdialysis procedures might interfere with the normal expression of behavior (Xue et al., 1996). All procedures were conducted in accordance with guidelines detailed in the NIH Guide for the Care and Use of Laboratory Animals and approved by Rutgers University Institutional Animal Care and Use Committee. Rats were administered the saline vehicle (0.9% NaCl in distilled water) or AMPH (4 mg/kg; dose as salt) twice daily for 12 days. All drug injections were given i.p. in a volume of 1 ml/kg. A group of 12 rats were assessed for their locomotor response to AMPH challenge throughout the chronic treatment regime and after short-term (2 days) and long-term (2–3 weeks) withdrawal from chronic AMPH. Behavioral testing was conducted every 4 days throughout chronic treatment, i.e. days 1, 5, 9, and 13. 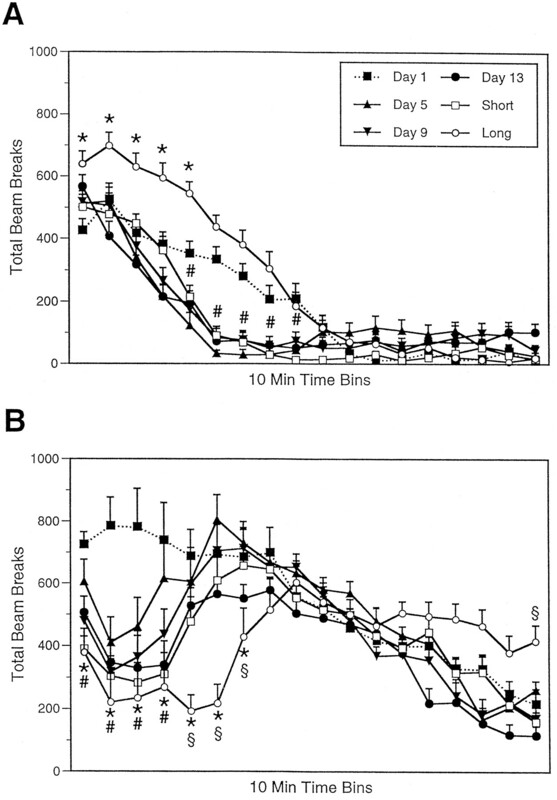 The experiment on day 1 therefore represented the behavioral response to AMPH in naive rats. Two challenge doses of AMPH were employed on each behavioral test day; a low dose (0.5 mg/kg) given at 09:00 h, and the chronic dose (4 mg/kg) given at 14:00 h. On test days animals were therefore examined twice: from 09:00 to 12:00 in response to the low dose, and from 14:00 h to 17:00 h in response to the chronic dose. Locomotion was measured using an activity system equipped with 32 infra-red photobeams arranged in an 8 × 4 array (San Diego Instruments, San Diego, CA). Horizontal photocell beam breaks were automatically counted in 10 min time bins for a total of 3 h for each test. In addition, a single visual determination for the presence of locomotion vs. focussed stereotypy was carried out 30 min after AMPH administration. Microdialysis probes of a concentric design were used. Construction of these probes has been described previously in detail (DeBoer and Abercrombie, 1996). Briefly, probes consisted of an 8 mm length of hollow dialysis fiber membrane (150 μm I.D., 160 μm O.D., 6000 MWCO; Spectra/Por, Spectrum, Houston, TX) with a 2 mm active area (restricted to 2 mm by thinly coating the upper 6 mm of the membrane with epoxy glue). PE-10 tubing (Clay Adams, Parsippany, NJ) served as the perfusion solution inlet and fused silica capillary tubing (I.D. 75 μm, O.D. 145 μm; Polymicro Technologies, Phoenix, AZ) served as the outlet. Probes were perfused with artificial cerebrospinal fluid (aCSF; NaCl 147 mM, KCl 2.5 mM, CaCl2 1.3 mM, MgCl20.9 mM, pH 7.4) at a rate of 1.5 μl/min with a microliter syringe pump (Harvard Apparatus Inc., South Natick, MA). The acetylcholinesterase inhibitor neostigmine (10 nM) was added to the aCSF solution to facilitate the detection of ACh in striatal dialysates. Microdialysis probes were stereotaxically implanted in striatum (AP +0.5 mm, ML +2.5 mm relative to bregma, and 6.5 mm ventral from dura;Paxinos and Watson, 1986) under chloral hydrate anesthesia (400 mg/kg). Three set-screws were first secured in the skull surrounding the implantation site. The probe was lowered to the designated depth slowly, attempting to minimize probe-inflicted damage to the striatum. Once implanted to the desired depth, the probe was fixed in place with fast-curing dental cement (Plastics One, Roanoke, VA). Inlet and outlet lines were taped to a metal spring tether that was fixed to the skull with fast-curing dental cement, which in turn was connected to a single-channel fluid swivel (Instech Laboratories, Plymouth Meeting, PA). After surgery, animals were allowed to recover overnight. Microdialysis experiments were conducted 16 to 20 hr after probe implantation. Dialysis samples were collected in 15-min fractions for analysis by HPLC. In all fractions, other than the sample collected immediately preceeding AMPH administration and the second sample collected after AMPH administration, 20 μl of dialysate were injected onto a cation-exchange HPLC for detection of ACh. In these latter two samples, the volume was split and the resulting 10-μl samples of dialysate were assessed for ACh and DA content. In the data analyses, the amount of ACh and DA obtained in these samples was doubled for consistency with the 20-μl samples. ACh detection essentially followed the method ofDamsma et al. (1987). ACh was separated by cation-exchange HPLC, using columns (100 × 2 mm) packed in-house with Chromspher 5C18 material (Chrompack, Middleburg, The Netherlands), and treated with sodium lauryl sulfate ion-pair solution (0.5% v/v; 30 min). Separation was followed by enzymatic degradation with an IMER. IMERs were prepared by loading guard columns with Lichrosorb.NH2(Merck, Darmstadt, Germany), and activated with glutaraldehyde solution (25%) pumped through the guard column at 0.1 ml/min for 10 min. Immediately after activation, the enzymes acetylcholinesterase (type VI-S; 80 U) and choline oxidase (40 U) were covalently bound to the activated Lichrosorb.NH2 by pumping a 0.5 ml solution of the enzymes through the IMER at 0.04 ml/min. IMERs were rinsed with mobile phase (0.35 ml/min, 30 min), and the system was typically left overnight before experimental use. This enzymatic degradation of ACh ultimately produced hydrogen peroxide, which was electrochemically detected with a platinum electrode (Antec, Leiden, The Netherlands) set at +0.50 V vs. a Ag/AgCl reference. The mobile phase consisted of a dipotassium hydrogen phosphate buffer (0.1 M, pH 7.8), containing tetramethylammonium chloride (0.15 mM), sodium octyl sulfate (SOS; 1.5 mM) and disodium ethylenediamine tetraacetate (EDTA; 0.1 mM) and was maintained at a flow rate of 0.35 ml/min (ESA model 580 Solvent Delivery System, ESA, Bedford, MA). The detection limit of the system for ACh varied between 5 to 15 fmol/20 μl sample. DA was analyzed by reverse-phase HPLC, using a Velosep RP-18 column (100 × 3.2 mm; Brownlee Labs, Foster City, CA) with a sodium acetate buffered (0.1 M; pH 4.1) mobile phase, containing ion-pairing SOS (1.2 mM), EDTA (0.1 mM) and 9% methanol (v/v). The mobile phase was delivered at 0.7 ml/min by a Waters 510 HPLC pump (Millipore, Milford, MA). DA was electrochemically detected with a glassy-carbon electrode (Antec, Leiden, The Netherlands) set at +0.60 V vs. a Ag/AgCl reference. The limit of detection for DA was between 2 to 4 fmol/20 μl. ACh sampled in striatal dialysates was tested to verify Ca++-dependence and to determine whether it altered in a characteristic manner in response to selective dopaminergic agonists. In Ca++-dependency experiments, aCSF was switched to Ca++-free aCSF (replaced with Mg++) for five sample fractions. To test pharmacological responsivity of ACh efflux, rats were administered either the selective D1 receptor agonist (+)SKF38393 (10 mg/kg) or the selective D2 receptor agonist quinpirole (3 mg/kg). Rats were administered a single challenge dose of either systemic AMPH (4 mg/kg) or local AMPH directly into striatum (10 μM in aCSF dialysis perfusion solution) once a stable ACh baseline had been obtained. Thus, although two challenge doses were used in the behavioral experiment, only a single AMPH dose/concentration was used in the neurochemical studies. The criterion for the baseline was the detection of ACh in three consecutive samples at levels that did not vary by more than 10% from one another. In experiments where AMPH was given systemically, postinjection samples were collected for a total of 4 hr. DA was assessed at two preselected time points, pre- and postdrug (see above). In local perfusion experiments, 10 μM AMPH was continuously administered and five samples were collected after switching to aCSF containing AMPH, correcting for lag in outlet volume. DA was not routinely determined in this latter condition. Data are the mean ± S.E.M. The effects of pharmacological challenge on striatal ACh efflux were assessed by one-way analysis of variance (ANOVA), followed by Fisher’s protected least significant difference (PLSD) post hoc tests, where appropriate. The effects of withdrawal from chronic saline pretreatment vs.chronic AMPH pretreatment on locomotor behavior and on striatal ACh neurochemistry were assessed by two-way ANOVA followed by Fisher’s PLSD. Comparisons between the effects of AMPH on striatal DA in rats from different pretreatment groups were assessed by unpairedt tests. Data populations were judged to be significantly different when P < .05.
d-Amphetamine sulfate was obtained from Sigma Chemical Co. (St. Louis, MO). (+)SKF38393 (R(+)-1-phenyl-2,3,4,5-tetrahydro-(1H)-3-benzazapine-7,8-diol hydrochloride) was obtained from RBI (Natick, MA). Quinpirole was a gift from Eli Lilly & Co. (Indianapolis, IN). In naive animals, an i.p. injection of saline resulted in 947 ± 90 total beam breaks in 3 hr whereas AMPH treatment produced a dose-related increase in locomotion, resulting in 3418 ± 316 beam breaks and 9670 ± 740 beam breaks after 0.5 and 4.0 mg/kg AMPH, respectively. In naive rats, neither dose of AMPH resulted in overt stereotyped behavior. The effects of chronic AMPH treatment and withdrawal on the locomotor response of rats to acute AMPH are shown in figure1. Analysis by two-way ANOVA revealed significant interactions between AMPH pretreatment/withdrawal and the behavioral response to subsequent AMPH challenge. 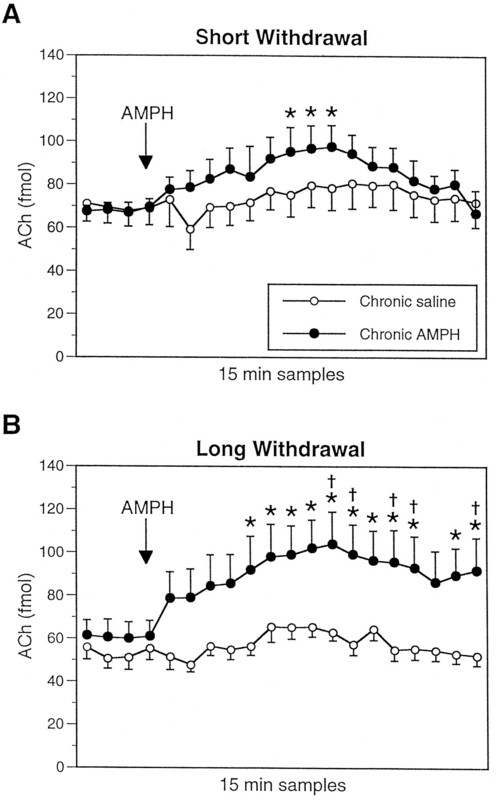 Chronic AMPH administration resulted in an attenuation of locomotion in response to 0.5 mg/kg AMPH, both throughout the chronic AMPH administration regime (days 5 to 13) and after short (2 day) withdrawal (fig. 1A). However, after long (2 to 3 wk) withdrawal from chronic AMPH, locomotion in response to 0.5 mg/kg AMPH was significantly potentiated (fig. 1A). Thus, chronic AMPH initially produced tolerance to the locomotor stimulant effects of 0.5 mg/kg AMPH, but after long withdrawal this effect was reversed to a state of sensitization. In contrast to the behavioral response to the low challenge dose of AMPH, chronic AMPH pretreatment/withdrawal produced a progressive and unidirectional sensitization of the behavioral response to 4.0 mg/kg AMPH. This latter dose of AMPH resulted in the expression of substantial focussed stereotypy that disrupted ambulatory behavior, leading to fewer infra-red beam breaks (fig. 1B). This effect was observed as early as day 5 of chronic AMPH treatment and increased significantly in duration over the course of withdrawal (fig. 1B). Locomotor activity measured by horizontal infra-red beam breaks in 10-min bins for a total of 3 hr. A shows the response to systemic amphetamine (AMPH) administration (0.5 mg/kg) in naive animals (day 1), throughout chronic AMPH treatment (days 5, 9 and 13), and after short withdrawal (2 days; short) and long withdrawal (2–3 wk; long) from the chronic AMPH regimen. Repeated-measures ANOVA revealed a significant interaction between AMPH pretreatment/withdrawal and locomotor counts (F85,1122 = 7.98, P < .0001). #P < .01 short withdrawal vs. day 1 (control), *P < .01 long withdrawal vs. day 1 (control), Fisher’s PLSD. B shows the locomotor response of rats to 4.0 mg/kg AMPH at the same test days. Repeated-measures ANOVA revealed a significant interaction between AMPH pretreatment/withdrawal and locomotor counts (F85,1122 = 4.69, P < .0001). #P < .01 short withdrawal vs. day 1 (control), *P < .01 long withdrawal vs. day 1 (control), §P < .01 short withdrawal vs. long withdrawal, Fisher’s PLSD.n = 12/test. Removal of Ca++ from the perfusion solution resulted in a rapid and significant reduction of striatal ACh efflux, from the basal extracellular level of 71.9 ± 13.5 to 23.5 ± 5.9 fmol/20 μl (fig. 2A). 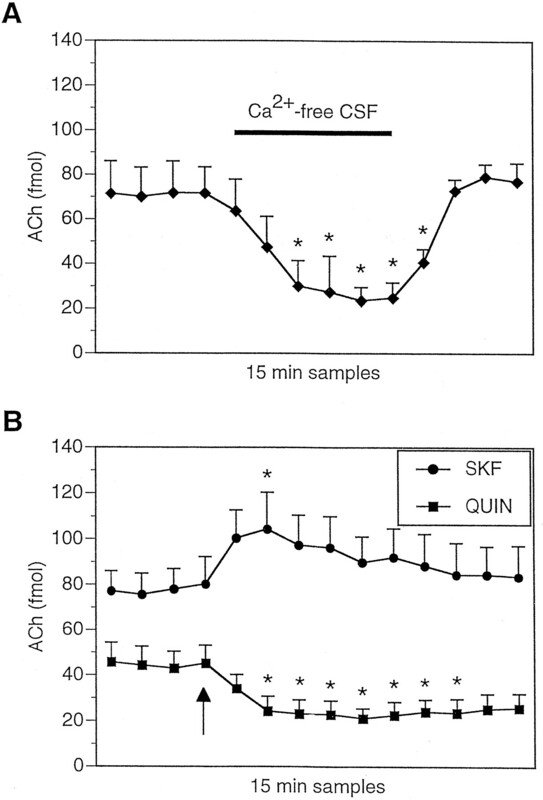 The attenuation of ACh efflux produced by lowering the extracellular Ca++ concentration was readily reversible after returning to 1.3 mM Ca++-containing aCSF (79.1 ± 10.1 fmol/20 μl within 30 min). The characterization of striatal acetylcholine (ACh) efflux in vivo. A shows the effect of the removal of Ca++ from the artificial cerebrospinal fluid (aCSF) microdialysis perfusion solution on striatal ACh efflux (fmol/20 μl). Ca++ was replaced by Mg++ for the duration of perfusion with the Ca++-free aCSF solution (shown by bar). ACh efflux was significantly reduced in the absence of Ca++in the perfusion solution analysis of variance (ANOVA), F17,51 = 8.05, P < .05, n = 4; *P < .01 vs. basal ACh efflux, Fisher’s PLSD. B shows that systemic administration of the dopamine D1 receptor agonist (+)SKF38393 (10.0 mg/kg; filled circles) significantly increases striatal ACh efflux (ANOVA, F13,52 = 7.52, P < .01,n = 5; *P < .05 vs. basal ACh efflux, Fisher’s PLSD) whereas systemic administration of the dopamine D2 receptor agonist quinpirole (3.0 mg/kg; filled squares) significantly diminishes the level of ACh detected in striatal dialysates (ANOVA, F13,78 = 9.51, P < .01, n = 7, *P < .05 vs. basal ACh efflux). Drugs were administered at the time indicated by the arrow. Systemic administration of the selective DA D1 receptor agonist (+)SKF38393 (10.0 mg/kg) significantly increased striatal ACh efflux from 77.7 ± 9.9 fmol/20 μl to a maximum of 104.3 ± 12.3 fmol/20 μl (fig. 2B). Conversely, the selective DA D2 receptor agonist quinpirole (3.0 mg/kg) significantly decreased striatal extracellular ACh from 44.3 ± 7.9 fmol/20 μl to a minimum of 21.1 ± 4.4 fmol/20 μl (fig. 2B). After 2 days of withdrawal from chronic AMPH pretreatment, rats given a systemic AMPH challenge (4.0 mg/kg) demonstrated a significant increase in striatal ACh efflux as measured by microdialysis (fig. 3A). In these animals, extracellular ACh increased from 69.5 ± 3.8 fmol/20 μl to a maximum level of 97.5 ± 10 fmol/20 μl (40.3% increase). In contrast, ACh efflux in striatum did not increase in response to a systemic AMPH challenge (4.0 mg/kg) in rats withdrawn for 2 days from chronically administered saline (fig. 3A). The effect of withdrawal from chronic treatment with saline or amphetamine (AMPH, 4.0 mg/kg, b.i.d. × 12 days) on striatal acetylcholine (ACh) efflux (fmol/20 μl) measured by microdialysis in response to subsequent acute AMPH challenge (4.0 mg/kg). After short withdrawal (2 days) from chronic AMPH, ACh efflux was significantly increased by systemic AMPH challenge (A, filled circles; analysis of variance (ANOVA), F19,114 = 8.12, P < .01,n = 7; *P < .01 vs. basal ACh efflux, Fisher’s PLSD). After long withdrawal (2–3 wk) from chronic AMPH, systemic AMPH challenge produced an increase in ACh efflux (B, filled circles; ANOVA, F19,76 = 10.4, P < .001,n = 5; *P < .01 vs. basal ACh efflux, Fisher’s PLSD) resulting in levels of extracellular ACh significantly higher than corresponding levels in rats previously treated with chronic saline (†P < .01, Fisher’s PLSD). ACh efflux was unaffected by AMPH challenge after either short withdrawal from saline (A, open circles; ANOVA, F19,114 = 2.82, P = 0.09, n.s., n = 7), or long withdrawal from saline (B, open circles; ANOVA, F19,76 = 3.37, P = .05, n.s.,n = 5). A similar, but more prolonged, profile of response to systemic AMPH (4.0 mg/kg) was observed in rats withdrawn for 2 to 3 wk from the chronic AMPH regime (fig. 3B). In response to AMPH challenge (4.0 mg/kg), striatal ACh efflux increased in these animals from a basal level of 60.9 ± 7.4 fmol/20 μl to a maximal level of 103.9 ± 15.1 fmol/20 μl (70.6% increase). This effect of systemic AMPH on striatal ACh levels in rats withdrawn from chronic AMPH for 2 to 3 wk was not observed in chronic saline-treated control animals (fig. 3B). Systemic AMPH administration (4.0 mg/kg) in saline-treated rats increased striatal DA efflux from 45.5 ± 2.3 to 587.4 ± 103.2 fmol/20 μl. This AMPH-mediated increase in DA efflux was not significantly altered after short or long withdrawal from either chronic saline or chronic AMPH (table 1). Administration of AMPH (10 μM) directly into striatum by reverse dialysis significantly reduced striatal ACh efflux (fig. 4). After short withdrawal (2 days) from chronic saline pretreatment, AMPH perfusion significantly attenuated ACh levels in striatum from 46.4 ± 2.5 to 27.2 ± 3.8 fmol/20 μl. A significant attenuation of striatal ACh efflux in response to local AMPH was also observed in rats withdrawn for 2 days from chronic AMPH. In these latter animals ACh decreased from 47.7 ± 1.8 to 18.2 ± 2.4 fmol/20 μl, a significantly greater attenuation than that seen in chronic saline-treated rats (fig. 4A). ACh efflux was also attenuated by the presence of local AMPH after long withdrawal (2 to 3 wk) from both chronic saline (from 58.6 ± 9.4 to 39.9 ± 8.2 fmol/20 μl) and chronic AMPH treatment (from 61.2 ± 6.7 to 39.9 ± 2.3 fmol/20 μl), but the ACh response in these two groups was not significantly different. Thus, after long withdrawal the attenuation in ACh efflux mediated by local AMPH perfusion in striatum was not significantly affected by chronic AMPH pretreatment (fig. 4B). The effect of withdrawal from chronic treatment with saline or amphetamine (AMPH, 4.0 mg/kg, b.i.d. × 12 days) on striatal acetylcholine (ACh) efflux (fmol/20 μl) measured by microdialysis in response to subsequent local perfusion with AMPH (10 μM) through the dialysis probe. Local AMPH decreased striatal ACh efflux in rats after short withdrawal from pretreatment with either saline (A, open circles; analysis of variance (ANOVA), F7,28 = 13.3, p < .005,n = 5) or AMPH (A, filled circles; ANOVA, F7,28 = 28.9, P < .0001, n = 5). ACh output decreased to a greater extent in AMPH-pretreated rats than in saline-pretreated animals after short withdrawal (A; ANOVA, F1,68 = 5.00, P < .05). After long withdrawal, AMPH application to striatum reduced ACh efflux similarly in both saline-treated rats (B, open circles; ANOVA, F7,21 = 16.4, P < .005, n = 4) and AMPH-treated rats (B, filled circles; ANOVA, F7,21 = 10.8, P < .01,n = 4). *P < .05 vs. basal ACh levels, †P < .05 vs. chronic saline group, Fisher’s PLSD. Preliminary data from separate groups of animals showed no differences in striatal DA efflux in response to local AMPH challenge (10 μM) after either short withdrawal (n = 3 for chronic AMPH,n = 2 for chronic saline; data not shown) or long withdrawal (n = 4 for both groups; data not shown). Our studies assessed the influence of withdrawal from chronic AMPH administration on striatal cholinergic neurochemistry and on behavior. Behavioral studies of locomotion in response to systemic AMPH were conducted to allow correlation of AMPH-induced changes in striatal neurochemistry with the development and strength of expression of behavioral sensitization to the stimulant. Although the behavioral studies presented clearly demonstrate the development of sensitization to AMPH, during the course of chronic treatment and after short withdrawal rats demonstrated a tolerance to the effects of the low dose of AMPH (0.5 mg/kg). 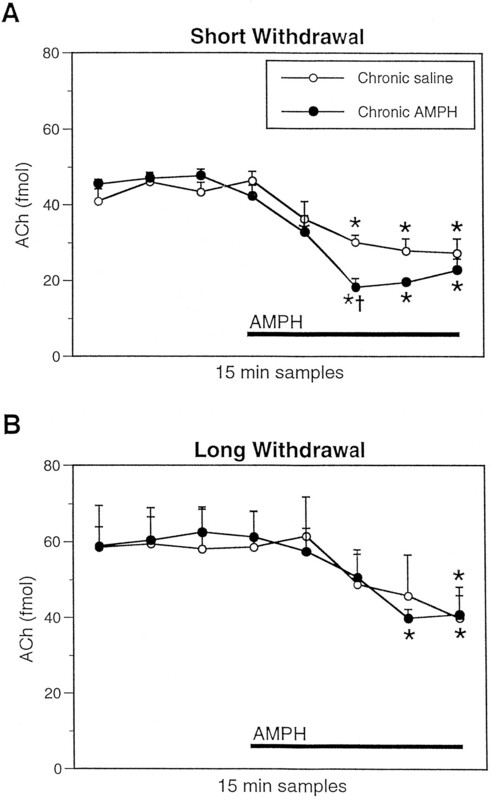 Thus, the low challenge dose of AMPH produced a sensitized locomotor response only after long withdrawal. It should be noted that this tolerance effect was not an artifact produced by an increase in stereotypy, but rather reflects a true decrease of locomotor behavior. Tolerance to the behavioral effect of low doses of AMPH after short withdrawal from chronic treatment has not previously been reported, and this likely is due to the use of challenge doses that are at least equivalent to the chronic administration dose in subsequent behavioral tests. The expression of a sensitized behavioral response to 4.0 mg/kg AMPH developed during chronic treatment (by day 5) and progressively was enhanced both as treatment continued and after withdrawal. Rats exhibited an increase in the expression of stereotyped behaviors in response to the higher dose of AMPH (4.0 mg/kg), resulting in a disruption of locomotor activity. This profile of locomotor response during bouts of stereotyped activity has been frequently reported (Segal and Mandell, 1974; Barnett et al., 1987;Robinson et al., 1988; Paulson et al., 1991; Xueet al., 1996). The behavioral observations of tolerance to the low dose of AMPH during treatment and after short withdrawal and sensitization to the high dose of AMPH both during treatment as well as after withdrawal, raise some interesting issues. First, during chronic psychostimulant administration and after short withdrawal periods, rats cannot be described as “sensitized” without including the caveat that sensitization only applies to the particular challenge dose of drug used. Moreover, sensitization to AMPH cannot be considered a phenomenon restricted to withdrawal, although long withdrawal did result in a greater degree of sensitization than short withdrawal. Second, these results may indicate differential alterations in the efferent function of the nucleus accumbens and striatum produced by chronic psychostimulants. These structures probably represent distinct neural substrates mediating the behavioral effects of lower and higher doses of AMPH, namely the induction of locomotor activity and stereotypy, respectively (Creese and Iversen, 1975). Administration of 0.5 mg/kg AMPH resulted exclusively in increased ambulation without the production of stereotypy. It may be, therefore, that a change in mesolimbic function is induced by short withdrawal from AMPH although a similar tolerance-related change is not present in striatum. Neurochemical correlates of expression of behavioral sensitization. The 4 mg/kg dose of AMPH was chosen for use in the neurochemical studies in view of the unidirectional and progressive development of behavioral sensitization produced by this challenge (see above). In rats chronically treated with saline, systemic AMPH administration did not alter striatal ACh release regardless of the time of cessation from vehicle treatment. In contrast, the profile of the ACh response changed such that striatal ACh efflux was enhanced by systemic AMPH in animals chronically treated with AMPH. This effect was observed after both short and long withdrawal. The increase in striatal ACh efflux observed after AMPH administration in AMPH-pretreated rats was longer-lasting in animals withdrawn for 2 to 3 wk compared with 2 days. These neurochemical results complement the behavioral results obtained with the same challenge dose of AMPH, in which the sensitized behavioral response was extended for a longer duration in long-withdrawal vs. short-withdrawal subjects. Thus, the observed alterations in cholinergic neurochemistry correlate temporally with the behavioral changes observed. Interestingly, although a change was observed in the responsivity of striatal ACh to systemic AMPH challenge in rats given chronic AMPH, no such alterations were observed regarding striatal DA function. Nevertheless, the AMPH schedule used was sufficient to induce significant behavioral sensitization. These results argue that while enhanced striatal DA release may occur in some circumstances after long withdrawal from psychostimulants, it is not a necessary factor in the expression of sensitization. As discussed previously, numerous reports have described a potentiation of AMPH-induced DA release in striatum after moderate to long withdrawal from AMPH (Robinson and Becker, 1986;Robinson et al., 1988; Patrick et al., 1991), but not after short withdrawal (Segal and Kuczenski, 1992b). The lack of an alteration in DA function after short withdrawal in the present studies is therefore in keeping with previous reports, although the lack of a significant effect after long withdrawal was somewhat surprising. However, in a recently published study by Heidbreder et al. (1996), a potentiation of striatal DA release in response to systemic cocaine was not observed until 22 days after cessation of chronic cocaine treatment. After 12 days, DA efflux was still lower in cocaine-pretreated rats in response to cocaine challenge than in saline-pretreated animals. Thus, the long withdrawal duration used in our study (14 to 21 days) may have been insufficient to produce significant sensitization of AMPH-induced DA release. Finally, although it is possible that our protocol assessing a single dialysis sample for DA content may have caused us to miss a potentiation of DA release, this is unlikely because the time chosen for the assessment of DA corresponds without exception to a point at which facilitated release of the transmitter has been observed in previous reports (Kazahayaet al., 1989; Akimoto et al., 1990; Patricket al., 1991; Heidbreder et al., 1996). In our study, extracellular ACh was reduced by approximately 35 to 40% by local AMPH administration (10 μM) in saline-treated rats, after both short and long withdrawal. However, local AMPH attenuated striatal ACh by nearly 65% after short withdrawal from chronic AMPH; a significantly larger decrease as compared to the saline pretreatment group. This effect did not extend to long withdrawal from AMPH, when the local inhibitory effect of AMPH in chronic AMPH-treated animals mirrored that seen in saline-treated animals. It is surprising that local AMPH should produce a potentiated inhibitory effect on striatal ACh after short withdrawal in the absence of any alteration in DA (unpublished data). This change in striatal ACh efflux presumably results from either a postsynaptic alteration in cholinergic cellular function or from a compensatory short-lasting change in neurochemical interactions within striatum. Our results do not offer any obvious answers to this apparent paradox; however, it is possible that changes in the responsivity of GABA and/or glutamate to DA, both of which influence ACh release, may be involved in the enhanced inhibitory effect of local AMPH on ACh efflux after short withdrawal. Whatever the mechanism, after short withdrawal from chronic AMPH the overall effect of systemic AMPH challenge on ACh output is presumably attenuated in magnitude by the enhanced local inhibitory effect of the drug in striatum. This may explain the greater effect of systemic AMPH on striatal ACh after long withdrawal; an increased local inhibitory effect of AMPH is not in effect at this time point. This course of events therefore may contribute to the strong correlation in the temporal profiles of both the neurochemical effect on ACh efflux produced by AMPH challenge and the expression of behavioral sensitization. Mechanisms of facilitated AMPH-induced ACh efflux in sensitized animals. We observed that systemic AMPH challenge, although having no effect on striatal ACh output in animals withdrawn from chronic saline treatment, evoked a significant increase in striatal ACh efflux after withdrawal from chronic AMPH. Systemic AMPH, by inducing release of DA, will activate both D1 and D2 DA receptor subtypes. As described above, there exist opposing D1-mediated excitatory and D2-mediated inhibitory mechanisms for regulation of striatal ACh efflux by DA (for discussion, see DeBoer and Abercrombie, 1996). For example, in our studies, the selective D1 receptor agonist (+)SKF38393 increased ACh efflux whereas the selective D2 receptor agonist quinpirole reduced this measure. These results are in agreement with numerous reports in the literature (Bertorelli and Consolo, 1990; Damsma et al., 1990b; Imperato et al., 1994; DeBoer and Abercrombie, 1996). In the case of saline-treated animals challenged with AMPH, it is proposed that the inhibitory influence of D2 receptor activation is offset by the facilitatory effects of D1 receptor activation resulting in little net change in ACh output. Thus, if the effects of AMPH challenge on striatal ACh can be assumed to result primarily from dopaminergic receptor activation, it is reasonable to conclude that the facilitatory D1 receptor-mediated effect predominates over the D2 receptor-mediated inhibition of striatal ACh in rats withdrawn from chronic AMPH. DA D2 receptors are thought to be located on the aspiny cholinergic interneurons in the striatum (Lehmann and Langer, 1983; LeMoineet al., 1990) and thus to directly mediate inhibitory dopaminergic effects on striatal ACh release (Scatton, 1982; Bertorelli and Consolo, 1990; DeBoer and Abercrombie, 1996). The potentiation of striatal ACh release through activation of DA D1 receptors may occur indirectly, however, via basal ganglia circuit mechanisms (Acquaset al., 1997; Damsma et al., 1991; DeBoer and Abercrombie, 1994). As suggested above, we hypothesize that the enhancement of striatal ACh efflux produced by systemic AMPH in rats withdrawn from chronic AMPH is due to an emergent predominance of the excitatory effect of DA acting at D1 receptors. However, it cannot be concluded from the results obtained with systemic AMPH challenge alone whether the predominating D1-mediated effect results from an increased D1 receptor influence, a diminished influence of striatal D2 receptors or a combination of the two. To address this question, local administration of AMPH through the microdialysis probe was used to investigate directly the inhibitory effects of chronic AMPH on striatal D2 receptor activation. Local AMPH (10 μM) attenuated extracellular ACh in rats from all pretreatment groups. Decreased D2-mediated inhibition of ACh efflux therefore cannot account for the potentiation of ACh efflux seen in the sensitized animals after systemic AMPH. Moreover, this observation further supports the hypothesis that the excitatory effect of systemic AMPH on ACh is initiated at a site outside striatum. A proposed model to explain the facilitatory effect of AMPH on ACh after both short and long withdrawal involves an increase in the relative effects on striatal ACh of D1-mediated excitationvs. D2-mediated inhibition. Previous studies (DeBoer and Abercrombie, 1994) have demonstrated that D1 receptor activation in substantia nigra results in a glutamate-mediated increase in striatal ACh. The model (DeBoer and Abercrombie, 1994; Timmerman and Abercrombie, 1996) proposes that activation of D1 receptors on striato-nigral GABAergic terminals disinhibits GABAergic nigro-thalamic neurons. In turn, disinhibition of efferent projections to thalamus results in excitation of thalamo-striatal and thalmo-cortico-striatal glutamatergic projection neurons leading to glutamate-mediated striatal ACh release. In support of this model, Damsma and colleagues (1991) have shown that reverse dialysis in striatum of the noncompetitive NMDA receptor antagonist MK-801 attenuates the increase in striatal ACh release produced by systemic administration of the D1 receptor agonist CY 208-243. We speculate that the activation of this circuit by systemic AMPH is potentiated in sensitized animals. The stimulation of substantia nigra D1 receptors and the subsequent enhancement of glutamatergic input to striatum are key events in the model described above. It is noteworthy that these same events previously have been linked to behavioral sensitization mechanisms. DA receptor activation in the VTA is important for the initiation of behavioral sensitization ultimately expressed via the nucleus accumbens (Vezina and Stewart, 1990; Perugini and Vezina, 1994; Cador et al., 1995). Moreover, it has recently been demonstrated that the VTA DA receptors responsible for mediating sensitization are, indeed, of the D1 subtype (Bjijou et al., 1996). Numerous studies show that chronic cotreatment with glutamate receptor antagonists blocks the initiation and expression of behavioral sensitization to psychostimulants (Karler et al., 1989; 1991; Wolf and Khansa, 1991; Stewart and Druhan, 1993). Furthermore, enhanced glutamate efflux in nucleus accumbens has recently been observed in behaviorally sensitized rats after withdrawal from chronic stimulant treatment (Pierce et al., 1996; Reid and Berger, 1996; but see Xue et al., 1996). Role of ACh in the expression of behavioral sensitization. Based on the results of our study, a possible inference is that sensitized behavioral responding to AMPH challenge may be mediated, at least in part, by the release of ACh in striatum. Our observations raise the issue of whether the effects of chronic AMPH withdrawal on ACh release and on the expression of behavioral sensitization are coincidental or whether ACh release in striatum plays an important functional role in the behavioral change. Thus, although AMPH-induced ACh efflux is increased in sensitized animals, this does not by itself necessarily implicate ACh functionally in the expression of sensitization. Enhanced glutamate release alone may be critical in determining behavioral sensitization (see above), or alternatively, both glutamate and ACh may possess important roles in the expression of this condition. Behavioral studies indicate that ACh is indeed critical for development of behavioral sensitization (Ohmori et al., 1995a, b) but that ACh may not be involved in the expression of this phenomenon (Heidbreder and Shippenberg, 1996). Further experimental work is needed to clarify the functional consequence of enhanced ACh efflux in response to AMPH challenge in sensitized animals. Based on a large literature showing an antagonistic relationship between DA and ACh in the modulation of basal ganglia-mediated behavior, it would not perhaps be predicted that behavioral sensitization to AMPH challenge would correlate with an enhancement of striatal ACh efflux. Numerous studies have shown, in naive rats, that increases in cholinergic tone decrease the behavioral response to dopaminergic agonists, and vice versa (Arnfred and Randrup, 1968; Costall and Naylor, 1972; Gonzalez and Ellinwood, 1984). Thus, one might have expected decreased cholinergic transmission would be associated with a sensitized behavioral response to AMPH. However, the degree of excitatory glutamatergic input to striatum has been shown to qualitatively affect the relationship between DA and ACh regarding the modulation of striatal output neuron activity (for review see Kitai and Surmeier, 1993). Based on the evidence supporting the role of glutamate in behavioral sensitization and on the present data, a situation of enhanced AMPH-induced glutamate neurotransmission is likely to arise in striatum of rats expressing behavioral sensitization to AMPH. Thus, in the condition of behavioral sensitization, DA and ACh may uniquely act in an additive or even synergistic manner to modulate the glutamate-driven activity of striatal medium spiny output neurons. Our study reports the first neurochemical evidence for plasticity of striatal cholinergic function in rats expressing behavioral sensitization after withdrawal from a chronic psychostimulant. The augmentation of striatal ACh efflux seen after AMPH challenge in animals withdrawn from chronic AMPH is correlated with the expression of behavioral sensitization observed in these animals. These results provide supporting evidence for an important role of striatal ACh release in the mechanisms that underly behavioral sensitization to AMPH, and perhaps other psychostimulant agents, and further highlight the potential significance of this transmitter in determining the functional output of the basal ganglia. Send reprint requests to: Dr. Elizabeth D. Abercrombie, Center for Molecular and Behavioral Neuroscience, Rutgers University, 197 University Avenue, Newark, NJ 07102. ↵1 This work was supported by National Institute for Drug Abuse Grant DA08086. E.D.A. is an Alfred P. Sloan Foundation Research Fellow. ↵2 Current address: Cerebrus Ltd., Silwood Park, Buckhurst Road, Ascot, Berkshire SL5 7PN, UK. (1997) Nonstriatal dopamine D1 receptors regulate striatal acetylcholine release in vivo. J. Pharmacol. Exp. Ther. 281:360–368. (1990) Enhanced extracellular dopamine level may be fundamental neuropharmacological basis of cross-behavioral sensitization between methamphetamine and cocaine—An in vivo dialysis study in freely moving rats. Brain Res. 507:344–346. (1968) Cholinergic mechanisms in brain inhibiting amphetamine-induced stereotyped behavior. Acta Pharmacol. Toxicol. 26:384–394. (1987) Repeated amphetamine pretreatment alters the responsiveness of striatal dopamine-stimulated adenylate cyclase to amphetamine-induced desensitization. J. Pharmacol. Exp. Ther. 242:40–47. (1985) Inhibition of the electrically evoked release of [3H]acetylcholine in rat striatal slices: An experimental model for drugs that enhance dopaminergic transmission. J. Neurochem. 44:331–337. (1990) D1 and D2 dopaminergic regulation of acetylcholine release from striata of freely moving rats. J. Neurochem. 54:2145–2148. (1996) Evidence for selective involvement of dopamine D1 receptors of the ventral tegmental area in the behavioral sensitization induced by intra-ventral tegmental area injections of D-amphetamine. J. Pharmacol. Exp. Ther. 277:1177–1187. (1995) Evidence for a complete independence of the neurobiological substrates for the induction and expression of behavioral sensitization to amphetamine. Neuroscience 65:385–395. (1988) The long-term effects of repeated amphetamine treatment in vivo on amphetamine, KCl and electrical stimulation evoked striatal dopamine release in vitro. Life Sci. 42:2447–2456. (1972) Modification of amphetamine effects by intracerebrally administered anticholinergic agents. Life Sci. 11:239–253. (1975) The pharmacological and anatomical substrates of the amphetamine response in the rat. Brain Res. 83:419–436. (1987) Measurement of acetylcholine release in freely moving rats by means of automated intracerebral dialysis. J. Neurochem. 48:1523–1528. (1990a) Dopaminergic regulation of striatal cholinergic interneurons: An in vivo microdialysis study. Naunyn-Schmiedeberg Arch. Pharmacol. 342:523–527. (1990b) Dopamine D1 receptor stimulation increases striatal acetylcholine release in the rat. Eur. J. Pharmacol. 186:335–338. (1991) Dopaminergic regulation of striatal acetylcholine release: Importance of D1 and N-methyl-D-aspartate receptors. J. Pharmacol. Exp. Ther. 259:1064–1072. (1994) Further characterization of the role of substantia nigra in the modulation of striatal acetylcholine in awake rats. Soc. Neurosci. Abstr. 20:126. (1996) Physiological release of striatal acetylcholine in vivo: Modulation by D1 and D2 dopamine receptor subtypes. J. Pharmacol. Exp. Ther. 277:775–783. (1988) Drugs abused by humans preferentially increase synaptic dopamine concentrations in the mesolimbic system of freely moving rats. Proc. Natl. Acad. Sci. U.S.A. 85:5274–5278. (1932) The effect of repeated doses of cocaine on the rat. J. Pharmacol. Exp. Ther. 46:199–202. (1973) Evolving behavior in the clinical and experimental amphetamine model psychosis. Am. J. Psychiat. 103:1088–1093. (1987) Striatal cholinergic function reflects differences in D-2 dopaminergic receptor activation. Life Sci. 41:1717–1723. (1984) Cholinergic modulation of stimulant-induced behavior. Pharmacol. Biochem. Behav. 20:397–403. (1991) Co-administration of either a selective D1 or D2 dopamine antagonist with methamphetamine prevents methamphetamine-induced behavioral sensitization and neurochemical change, studied by in vivo intracerebral dialysis. Brain Res. 54:40–46. (1996) Evidence for an involvement of muscarinic cholinergic systems in the induction but not expression of behavioral sensitization to cocaine. Synapse 24:182–192. (1996) Role of dopamine in the initiation and long-term expression of behavioral sensitization to cocaine. J. Pharmacol. Exp. Ther. 278:490–502. (1994) Does dopamine exert a tonic inhibitory control on the release of striatal acetylcholine in vivo? Eur. J. Pharmacol. 251:271–279. (1988) Effects of daily cocaine and morphine treatment on somatodendritic and terminal field dopamine release. J. Neurochem. 50:1498–1504. (1993) Time course of extracellular dopamine and behavioral sensitization to cocaine. I. Dopamine axon terminals. J. Neurosci. 13:276–284. (1991) Dopamine transmission in the initiation and expression of drug- and stress-induced sensitization of motor activity. Brain Res. Rev. 16:223–244. (1993) The pharmacology and neural circuitry of sensitization to psychostimulants. Behav. Pharmacol. 4:315–334. (1989) Blockade of “reverse tolerance’ to cocaine and amphetamine by MK 801. Life Sci. 45:599–606. (1991) DNQX blockade of amphetamine behavioral sensitization. Brain Res. 552:295–300. (1989) Subchronic methamphetamine treatment enhances methamphetamine- or cocaine-induced dopamine efflux in vivo. Biol. Psychiat. 25:902–912. (1993) Cholinergic and dopaminergic modulation of potassium conductances in neostriatal neurons. in Advances in Neurology, eds Narabayashi N., Nagatsu T., Yanagisawa N., Mizuno Y. (Raven Press, New York, NY), 60:40–52. (1985) Time course of the development of the enhanced behavioral and biochemical responses to amphetamine after pretreatment with amphetamine. Neuropharmacology 24:823–829. (1983) The striatal cholinergic interneuron: synaptic target of dopaminergic terminals? Neuroscience 10:1105–1120. (1990) D2 dopamine receptor gene expression by cholinergic neurons in the rat striatum. Neurosci. Lett. 117:248–252. (1995a) Scopolamine prevents the development of behavioral sensitization. Life Sci. 56:1223–1229. (1995b) Scopolamine prevents the augmentation of stereotypy induced by chronic methamphetamine treatment. Psychopharmacology 121:158–163. (1991) Concomitant sensitization of amphetamine-induced behavioral stimulation and in vivo dopamine release from rat caudate nucleus. Brain Res. 538:343–346. (1991) Time course of transient behavioral depression and persistent behavioral sensitization in relation to regional brain monoamine concentrations during amphetamine withdrawal in rats. Psychopharmacology 103:480–492. (1986) The Rat Brain in Stereotaxic Coordinates. (Academic Press, San Diego, CA). (1994) Amphetamine administered to the ventral tegmental area sensitizes rats to the locomotor effects of nucleus accumbens amphetamine. J. Pharmacol. Exp. Ther. 270:690–696. (1996) Repeated cocaine augments excitatory amino acid transmission in the nucleus accumbens only in rats having developed behavioral sensitization. J. Neurosci. 16:1550–1560. (1976) Increasing effects of repetitive cocaine administration in the rat. Nature 260:731–732. (1996) Evidence for sensitization of cocaine-induced nucleus accumbens glutamate release. Neuroreport 7:1325–1329. (1991) Apparent synaptic dopamine deficiency induced by withdrawal from chronic cocaine treatment. Brain Res. 538:337–339. (1982) Behavioral sensitization is accompanied by an enhancement in amphetamine-stimulated dopamine release from striatal tissue in vitro. Eur. J. Pharmacol. 85:253–254. (1986) Enduring changes in brain and behavior produced by chronic amphetamine administration: A review and evaluation of animal models of amphetamine psychosis. Brain Res. Rev. 11:157–198. (1993) The neural basis of drug craving: An incentive-sensitization theory of addiction. Brain Res. Rev. 18:247–291. (1988) Persistent sensitization of dopamine neurotransmission in ventral striatum (nucleus accumbens) produced by prior experience with (+)-amphetamine: A microdialysis study in freely moving rats. Brain Res. 462:211–222. (1992) A lasting vulnerability to psychosis in patients with previous methamphetamine psychosis. Ann. N.Y. Acad. Sci. 654:160–170. (1982) Effect of dopamine agonists and neuroleptic agents on striatal acetylcholine transmission in the rat: Evidence against receptor multiplicity. J. Pharmacol. Exp. Ther. 220:197–202. (1992a) Repeated cocaine administration induces behavioral sensitization and corresponding decreased extracellular dopamine responses in caudate and accumbens. Brain Res. 577:351–355. (1992b) In vivo microdialysis reveals a diminished amphetamine-induced dopamine response corresponding to behavioral sensitization produced by repeated amphetamine pretreatment. Brain Res. 571:330–337. (1974) Long-term administration of d-amphetamine: Progressive augmentation of motor activity and stereotypy. Pharmacol. Biochem. Behav. 2:249–255. (1993) Development of both conditioning and sensitization of the behavioral activating effects of amphetamine is blocked by the non-competitive NMDA receptor antagonist, MK-801. Psychopharmacology 110:125–132. (1996) Amphetamine-induced release of dendritic dopamine in substantia nigra pars reticulata: D1-mediated behavioral and electrophysiological effects. Synapse 23:280–291. (1995) Intermittent and chronic morphine treatment induces long-lasting changes in ∂-opioid receptor-regulated acetylcholine release in the rat striatum and nucleus accumbens. Eur. J. Pharmacol. 283:169–176. (1990) Amphetamine administered to the ventral tegmental area but not to the nucleus accumbens sensitizes rats to systemic morphine: Lack of conditioned effects. Brain Res. 516:99–106. (1989) Environment-specific cross-sensitization between the locomotor activating effects of morphine and amphetamine. Pharmacol. Biochem. Behav. 32:581–584. (1996) Glutamatergic and cholinergic regulation of immediate-early gene and neuropeptide gene expression in the striatum. in Pharmacological Regulation of Gene Expression in the CNS, ed Merchant K. (CRC Press, New York, NY), pp 81–113. (1991) Repeated administration of MK-801 produces sensitization to its own locomotor stimulant effects but blocks sensitization to amphetamine. Brain Res. 562:164–168. (1993) Differential development of autoreceptor subsensitivity and enhanced dopamine release during amphetamine sensitization. J. Pharmacol. Exp. Ther. 264:249–255. (1996) Acute and repeated systemic amphetamine administration: Effects on extracellular glutamate, aspartate, and serine levels in rat ventral tegmental area and nucleus accumbens. J. Neurochem. 67:352–363.